You are currently browsing the tag archive for the ‘tulips’ tag. Hey look, photos of pretty flowers! It must be time for the April 2014 Garden Bloggers’ Bloom Day. We’ll start with what’s blooming outside the casa. Everyone likes April flowers, right? I can’t get enough of those pink blooms! Two of the Schlumbergeras are blooming again. I hadn’t really noticed until mr_subjunctive mentioned it, but one plant produces red blooms, and another produces orange ones (that plant was originally from Dottie). I thought for a long time they both had red blooms but the orange was more pronounced this past season. I tried several times to capture the difference in hues on camera, but without wanting to move the plants (for fear of knocking the flowers off), I wasn’t able to accomplish that. I love them! So snazzy! Or maybe not, haha! You may have to take my word for it. My regular readers know how fond I am of Chlorophytum comosum ‘Spider Plant’ flowers. I think they are so darling! Or possibly coming in for a landing! Thanks to Carol over at May Dreams Gardens for suggesting we post photos of what’s blooming in and around the house on the 15thish of each month. You should check out her posts, as well as flower posts from around the world. Hello honeybees, and happy Friday! Oh sweet Friday, we welcome you once again! You signal the end of the workweek and the beginning of our puzzler fun. Hmmm. That’s three votes real, zero votes fake, one vote other? I don’t know if the wider view is definitive or not, but they were REAL! Cool looking as well. Corkscrew Rush, these were at the Ikea in Denver. They are weird-looking, water-loving plants. I’m surprised they were as healthy as they were, given their reputation for fickleness as houseplants (and that they were at a retail store as opposed to a nursery). Good job Joseph! You were first with the correct answer, which makes you the best answerer. Well done! For being so speedy, this week you’ve earned the following title: Maneater, Ladies Man, Man’s Man, King of the World, King of the Road, King of Beers, Beerolicious, Delicious, FancyPants, FlashyPants, Flasholicious, Grandmaster Flash, Flash Gordon WINNER!!!!! Congratulations! You may multiply all the prizes by tacos. Everyone’s a winner! To show my appreciation for you playing, I’d like to award each of you the following prizes: April, your own fan base, 17 1/2 bonus points, a framed photo of a framed photo, 28 blue butterflies, even more basketball, 12 blessings, one road trip, a bespectacled peacock, three meaningful moments, an extra aura, six barbecued waffles, four roller skates, shampoo, a chunky necklace, seven mild temperatures, a full moon weekend, one mellow mountain range, two shrubs, five hard boiled eggs, an ocean of love, and lavish praise. Congrats, and thanks again for playing. This week’s puzzler was sent in by my long-time friend Stephanie, who lives in Indy. She asks, are these tulips real or fake? Think you know the answer, smartyplants? Leave your best guess in the comments section or on my facebook wall. You have until midnight next Thursday, April 3rd, MST (that’s 2a.m. EST) to cast your vote. I’ll reveal the answer and the winner(s) next week. Remember, the prizes may be imaginary but the link to your site and the glory of winning are oh-so-real. Aaahhhh, it’s time to share photos of what’s blooming in and around the casa, courtesy of host Carol from May Dreams Gardens (in Indianapolis). How can you not love a flower that has purple checkered petals? The rain is much appreciated. Be sure to check out Carol’s blog for flower photos from around the world. She hosts the GBBD every month around the 15th. If you have flower photos you’d like to share, but don’t have a blog of your own, you can send your photos to me and I’ll post them in the coming week. You can include info about the flowers if you want, or just send the photos alone – it’s your call. I hope everyone has a nice weekend, thanks for visiting my site. Aaaahh, fresh flowers in December. And not *&^#$@ Poinsettias. I have a friend in the hospital, and let’s face it, this is an extra sucky time of year to be in the hospital. So I went looking for fresh flowers to bring him. I wanted Freesia, because the smell would’ve livened up his hospital room, but I couldn’t find any, it’s just not in season. If I wanted fragrance, my only choice was Stargazer Lilies – you know those great big white Lilies with pink on the inside and the super strong smell? I couldn’t bring myself to do it. People either love that smell, or are grossed out by it. And in a small hospital room? No thanks. So I decided on Tulips. They’re so elegant and beautiful. I gave him the bouquet but I kept one at home so I could see how long they’d last (well over a week!). I hope you get well soon, my friend! Another friend of mine told me that Tulips were her favorite flowers because she loved how they flopped over out of the vase. 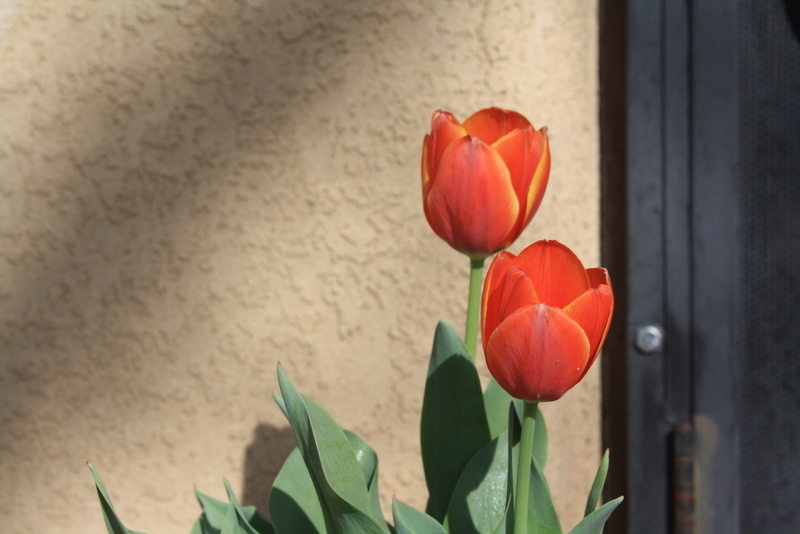 I love how Tulips flop over, too, but I learned something a few years ago that cracked me up. 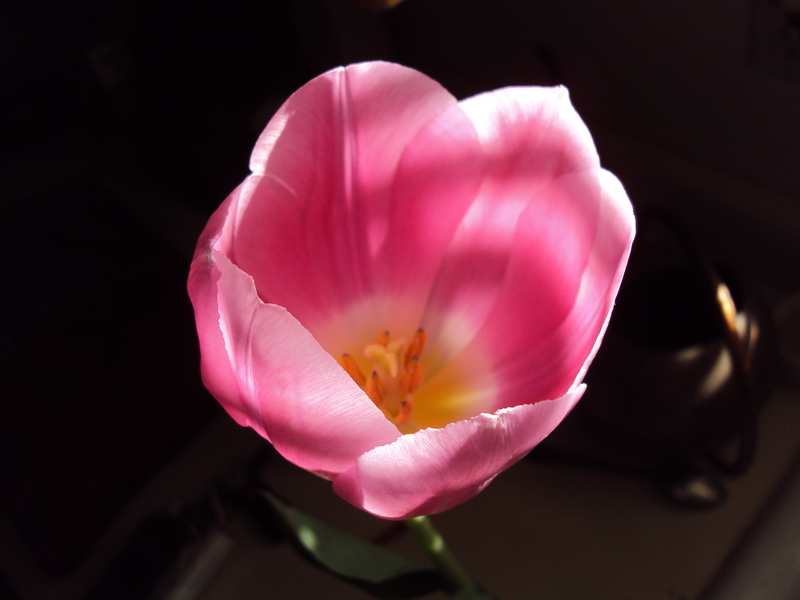 It turns out that if you put five or six pennies in the bottom of the vase, the Tulips stand up straight. Apparently, it also works with Vodka. I don’t know what Vodka and pennies have in common, but I do know the pennies work (like I’m going to waste Vodka on a flower experiment – hah!). They look strange to me standing up (I didn’t put pennies in this tulip’s vase, btw) but if the floppiness bothers you, now you know how to fix that. It’s Christmas week! Even in Albuquerque, it gets cold. 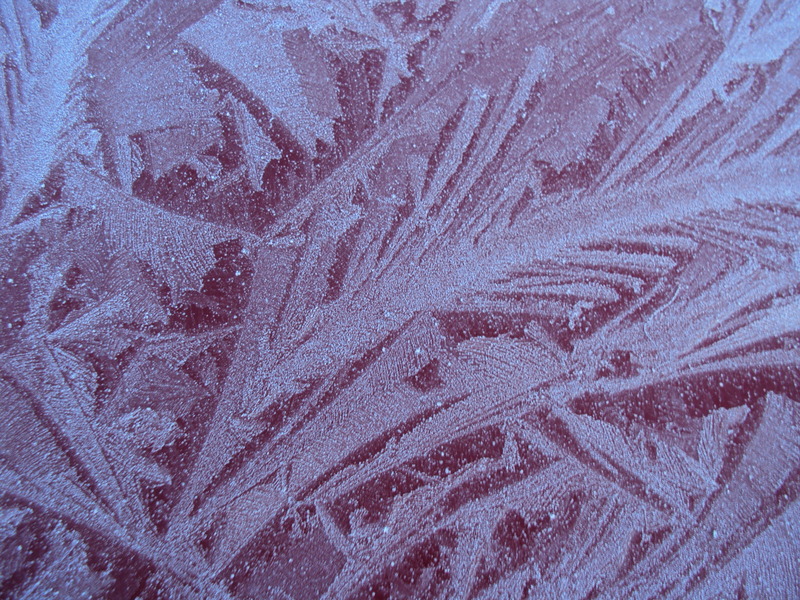 This is my car the other morning. 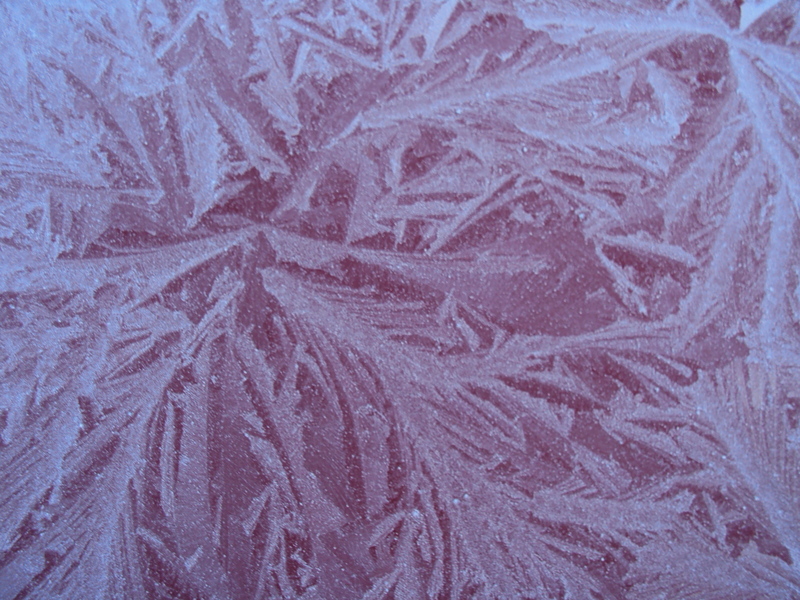 Isn’t the frost pretty? No really, I don’t smoke crack, I swear! It reminded me of flowers. 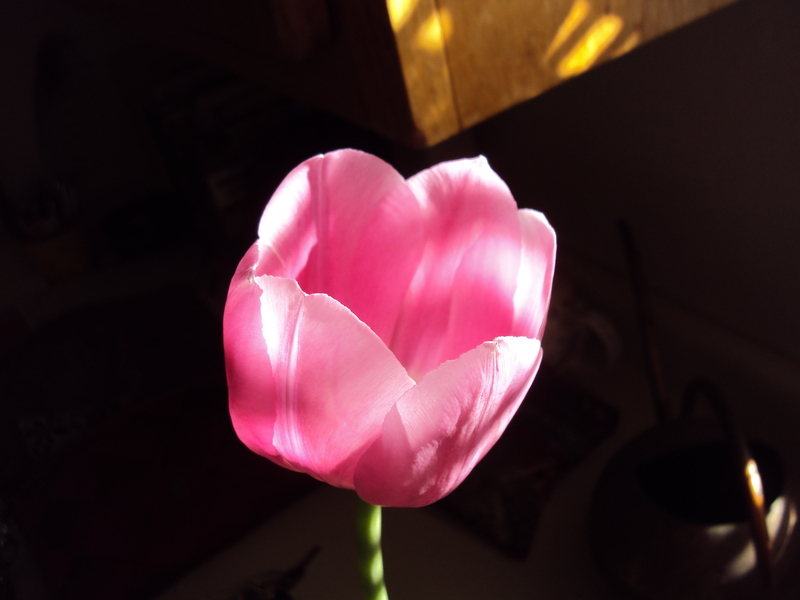 Even in the dark of winter, you can buy Tulips to brighten someone’s day, and your own. How cool is that? Happy Tuesday, everyone, and happy indoor gardening!